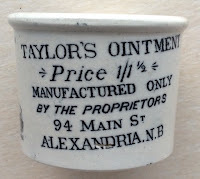 Taylors Ointment was sold by a druggist and chemist named Douglas Mitchell, based in Main Street, Alexandria, N.B. (North Britain). 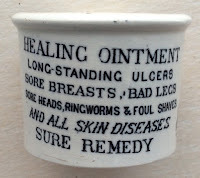 References to this are recorded in local records in the 1880's. 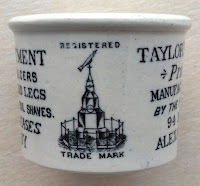 The pot is printed all around the body and carries a nice pictorial of a monument depicting a fountain that was erected in the town of Alexandria.